Arthur K. Wheelock Jr., “Nicolaes Pietersz Berchem/View of an Italian Port/early 1660s,” Dutch Paintings of the Seventeenth Century, NGA Online Editions, https://purl.org/nga/collection/artobject/71554 (accessed April 19, 2019). In this scene, Nicolaes Pietersz Berchem captures both the beauty of the Italian landscape and the cool, crystalline light that imbues it with its distinctive atmospheric quality. Towering cliffs, surmounted by a round bastion and a sturdy tower, form the dramatic backdrop for the arrival of a Dutch merchant ship in a calm harbor. The galley with the furled sail lies tilted to one side, indicating that it is low tide. Two lighters—small wide-bottom barges used to ferry goods to ships anchored in deeper water—seem to await the Dutch ship’s arrival. A hunting party joins several cattlemen and goatherds at the water’s edge. The elegant couple on horseback is focused on the falcon airing its wings on the woman’s arm. The man with the staff standing next to the pair is likely the master of the hunt, the individual in charge of the dogs. Berchem was one of the most popular and successful of the Dutch seventeenth-century Italianate landscape painters. A native of Haarlem, he probably visited Italy sometime between 1653 and 1656. Berchem’s extensive oeuvre of paintings, drawings, and etchings consists of imagined views of the Italian countryside, depictions of the hunt, as well as biblical and mythological scenes. The large number of prints made after his paintings in the seventeenth and eighteenth centuries is indicative of Berchem’s fame. I would like to thank Yonna Yapou for sharing with me the research she did on this painting while it was in the possession of Mr. and Mrs. Smith. Situated against a backdrop of towering cliffs that drop straight down to the calm waters below, the exotic character of this harbor setting is defined not by buildings or wharfs but by the various types of figures that have come together at the water’s edge. The most prominent of these is the elegant couple who, fresh from the hunt, sit astride their steeds. Wearing wide-brimmed hats with flowing feathers, they talk to a standing gentleman while the woman’s falcon airs its wings. The gentleman holding his staff is probably the keeper of the hunting dogs that are seen mingling, two of them being held by a young assistant in the lower left. What has brought them to the harbor is not clear, but they may well be awaiting a ferry to transport them either to one of the ships anchored in deeper water or to the far shore. Behind them two wide-bottomed ferries are already loaded with cargo. In the one filled with cattle, two figures wrestle a recalcitrant goat along a gangplank, while before the other ferry two men in Oriental dress stand and talk, while a third sits in the boat, waiting for it to push off. In the right foreground, a shepherd tending to a cow and some sheep also awaits transport. Despite the fact that Italianate-style paintings exist in Berchem’s oeuvre as early as the late 1640s, it seems unlikely that Berchem had actually visited Italy by this date. It is more probable, as recent scholars have postulated for stylistic reasons, that Berchem traveled there between 1653 and 1656. In any case, by the late 1650s he had become one of the most sensitive interpreters of both the pastoral and the exotic character qualities of Italy. because it is highly unlikely that he could otherwise have captured the special light and character of this faraway land with such seeming effortlessness. While View of an Italian Port does not represent an identifiable location, such details as the characteristic Italian ship anchored offshore, with its long red oars stretching out to either side, point to Berchem’s careful observation of what, for a Dutchman, was an unusual type of vessel. Just where Berchem might have seen such cliffs is not known, but similar formations surmounted by large buildings appear in the background of a number of his paintings. 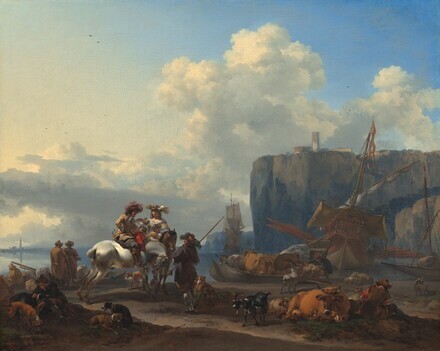 Comparable cliffs can be seen in paintings by other artists, as in Coastal Landscape by Moonlight, attributed to Aelbert Cuyp, in the Six Collection, Amsterdam. “On admire dans ce tableau . . . tout le goût, tout l'esprit du célèbre Berchem. La composition en est bien ordonnée, les groupes en sont disposés et variés avec beaucoup d’intelligence; l’air circule partout, la dégradation des plans est parfaite. L’exécution, la conservation ne laissent rien à désirer.” Catalogue des tableaux italiens flamands, hollandais et franç̧ais: Des anciennes écoles, qui composent la magnifique galerie de M. le Chevalier Érard (Paris, 1831), 83. The collection was sold the following year, in 1832, and the sale catalog was based on this one. The same white horse appears in Berchem’s A Hawking Party Halting at a Farrier’s Shop, formerly in the Kaiser Friedrich Museum, Berlin, reproduced in Staatliche Museen, Berlin, 1932, cat. 896 (see John Smith, A Catalogue Raisonné of the Works of the Most Eminent Dutch, Flemish and French Painters, 9 vols. [London, 1829–1842], 5:99, cat. 310), and in a related drawing in the British Museum, London (see Arthur Mayger Hind, Catalogue of Drawings by Dutch and Flemish Artists Preserved in the Department of Prints and Drawings in the British Museum, 5 vols. [London, 1915–1932], 3:33–34, no. 34, pl. xviii). Johan van Lanschot, Leiden, by 1753; by inheritance to his son-in-law, Pieter Cornelis, baron van Leyden [1717-1788, known during his lifetime as the Heer van Leyden van Vlaardingen], Leiden; by inheritance with the paintings in his collection to his son, Diederik van Leyden, [1744-1810/1811], Leiden and Amsterdam; sold, with the rest of his father's painting collection, for 100,000 florins to a consortium formed by L.B. Coclers, Alexander Joseph Paillet, and A. de Lespinasse de Langeac; (sale of the van Leyden painting collection, A. Paillet and H. Delaroche, Paris, 5-8 November 1804, 1st day, no. 8); H. Delaroche. John Parke, Esq., London; (his sale, Peter Coxe, London, 8-9 May 1812, no. 37). (John Smith, London); sold to John Webb, Esq., London. Chevalier Sébastien Érard [1752-1831], Château de la Muette, near the Bois de Boulogne, Paris; (his estate sale, at his residence by Lacoste and Coutelier, 7-14 August 1832 [originally scheduled for 23 April and days following], no. 62); purchased by Alexis-Nicolas Pérignon, Paris, for Jonkheer Johan Steengracht van Oostcapelle [1782-1846], The Hague; by inheritance to his son, Hendrik Steengracht van Oosterland [1808-1875], The Hague; by inheritance to his nephew, Hendricus Adolphus Steengracht van Duivenvoorde [1836-1912], The Hague; (his estate sale, Galerie Georges Petit, Paris, 9 June 1913, no. 4); Mr. Boyer. by inheritance from the collector’s grandfather to private collection; (sale, Adar Picard Tajan, Paris, 9 April 1990, no. 82); Robert H. and Clarice Smith, Washington; gift 1990 to NGA. Van Lanschot is identified by the inscription on an engraving of the painting executed by Abraham Delfos in 1753. Given the family connection between Van Lanschot and Van Leyden, it is probable that the painting engraved was the Gallery’s, although, as Egbert Haverkamp-Begemann has noted, it is possible that one of the copies after View of an Italian Port was the model for the print. See the description of Sale F-80, by Benjamin Peronnet, in The Getty Provenance Index© Databases, accessed 17 February 2012, and J.W. Niemeijer,“Baron van Leyden, Founder of the Amsterdam Print Collection,” trans. Patricia Wardle, Apollo (June 1983): 461-468. As Niemeijer explains, in Van Leyden’s own day the title of baron was not actually used; when alive he was known as the Heer Van Leyden van Vlaardingen. He is given the title of baron in later publications, a title that was indeed his, as an ancestor was created a baron of the Holy Roman Empire in 1548. Niemeijer 1983, 468. While his son inherited the paintings, Van Leyden’s large and important print collection was bequeathed to his grandson, after whose death in 1789 it became the property of the young man’s mother. Sold in 1806 to Louis Napoleon, it was first housed in The Hague, then Paris, and was eventually returned in 1816 to Amsterdam, where it formed the nucleus of the print collection at the Rijksmuseum. This information is given in the catalogue for sale 6323 at Christie’s, London, 7 July 2000, as part of the provenance for lot 17 (Jan Both, An Italianate evening landscape with a muleteer and goatherds on a wooded path, a river and mountains beyond, now NGA 2000.91.1, An Italianate Evening Landscape), but no source is cited. The sale was originally scheduled for 5 July 1804, and rescheduled for 10 September 1804 (the date printed on the sale catalogue), before finally taking place in November. The catalogue incorrectly described the painting as being on panel. The information about Parke’s ownership through that of Steengracht is found in the 1913 sale catalogue. An annotated copy of the auction catalogue housed at the NGA library notes that Boyer purchased the picture for Fr 7,900. The support, a medium-weight, plain-weave fabric, is loosely woven of irregularly spun threads. Part of the original tacking margins were retained at the time of lining and incorporated into the picture plane, slightly expanding the dimensions on all four sides. Lining has reinforced the weave texture. Paint is applied over an off-white ground in thin opaque layers worked wet over dry. Minor losses are confined to the edges. The upper right corner of the sky is abraded, as are the edges. No treatment has been undertaken at the National Gallery. Smith, John. A Catalogue Raisonné of the Works of the Most Eminent Dutch, Flemish and French Painters. 9 vols. London, 1829-1842: 5(1934):47, no. 137. Catalogue des tableaux italiens, flamands, hollandais et français: des anciennes écoles, qui composent la magnifique galerie de M. le Chevalier Érard. Paris, 1831: 82-83, no. 62. Waagen, Gustav Friedrich. Treasures of Art in Great Britain: Being an Account of the Chief Collections of Paintings, Drawings, Sculptures, Illuminated Mss.. 3 vols. Translated by Elizabeth Rigby Eastlake. London, 1854: 2:95. Hofstede de Groot, Cornelis. A Catalogue Raisonné of the Works of the Most Eminent Dutch Painters of the Seventeenth Century. 8 vols. Translated by Edward G. Hawke. London, 1907-1927: 9(1926):80, no. 107. Hofstede de Groot, Cornelis. Beschreibendes und kritisches Verzeichnis der Werke der hervorragendsten holländischen Maler des XVII. Jahrhunderts. 10 vols. Esslingen and Paris, 1907-1928: 9(1926):80, no. 107. Schaar, Eckhard. Studien zu Nicolaes Berchem. Cologne, 1958: 86. National Gallery of Art. Art for the Nation: Gifts in Honor of the 50th Anniversary of the National Gallery of Art. Exh. cat. National Gallery of Art, Washington, 1991: 74-75, color repro. Wheelock, Arthur K., Jr. Dutch Paintings of the Seventeenth Century. The Collections of the National Gallery of Art Systematic Catalogue. Washington, 1995: 23-24, color repro. 25. Waagen, Gustav Friedrich. Treasures of Art in Great Britain. Translated by Elizabeth Rigby Eastlake. Facsimile edition of London 1854. London, 2003: 2:95. Vries, Annette de, Quentin Buvelot, and Femke Foppema. Passie voor schilderijen: de verzameling Steengracht van Duivenvoorde. Exh. cat. Kasteel Duivenvoorde, Voorschoten. Leiden, 2012: 42, 84-85, color repros. 5 and 35. I would like to thank Yonna Yapou for sharing with me the research she did on this painting while it was in the possession of Mr. and Mrs. Smith. Despite the fact that Italianate-style paintings exist in Berchem’s oeuvre as early as the late 1640s, it seems unlikely that Berchem had actually visited Italy by this date. It is more probable, as recent scholars have postulated for stylistic reasons, that Berchem traveled there between 1653 and 1656. In any case, by the late 1650s he had become one of the most sensitive interpreters of both the pastoral and the exotic character qualities of Italy. This date is also suggested by Eckhard Schaar, Studien zu Nicholaes Berchem (Cologne, 1958), 86. Copies and versions include: Collection of the Duke of Devonshire, Chatsworth; sale, Christie’s, New York, June 15, 1977, no. 117 (in 1996 with Daphne Alazraki Old Master Paintings, New York); sale, Galerie Le Brun by Bonnefons de Lavialle and George, Paris, June 7, 1853, no. 4; sale, Artaria and others, Vienna, January 12, 1886, no. 8; and possibly sale, P. van den Bogaerde, Amsterdam, March 16, 1778, no. 3. See Albert Blankert, Nederlandse 17e eeuwse Italianiserende Landschapschilders (Utrecht, 1965), 158–159, cat. 81; and the expanded, English edition Albert Blankert, Dutch 17th-Century Italianate Landscape Painters (Soest, 1978), 158–159, cat. 81.